With his Nocturnes, Debussy’s vision of music inspired by Nature enters a new sphere. His first multi-part orchestral work – the composition was originally conceived for violin but was published as a vocal-symphonic work – offers a wealth of subtleties as regards melody and sound colouring, the likes of which had never been heard before in Debussy’s oeuvre. Unlike traditional orchestral writing, the woodwinds here provide motivic vitality with a wide spectrum of tonal colouring while the strings unroll a dynamically finely graded carpet of sound. Absolutely innovative is the wordless female chorus in the third movement whose voices combine with the instruments to produce a mysterious tonal concoction. TAS Recommended! Rated a 'Best Audiophile Label Recording' The Absolute Sound! 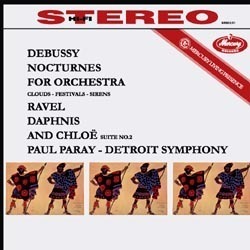 Paul Paray and the Detroit Symphony perform Debussy's Nocturnes for orchestra, Clouds, Festivals and Sirens as well as Ravel's Daphne and Chloe Suite No. 2.